Bring the milk, cloves and bay leaves almost to a boil, then turn off the heat. Preheat oven to 350 degrees. Melt the butter in a saucepan, stir in the flour. Cook for a few minutes, pour in the milk and stir until thickened. Whisk recommended. Season with salt, pepper and a grating of fresh nutmeg. Stir in the heavy cream and cheese. Meanwhile, in a large pot, bring some salted water to a boil. Cut the cabbage in half, and then into thick wedge-like slices. Add it to the boiling water for a few minutes just to wilt. Drain. 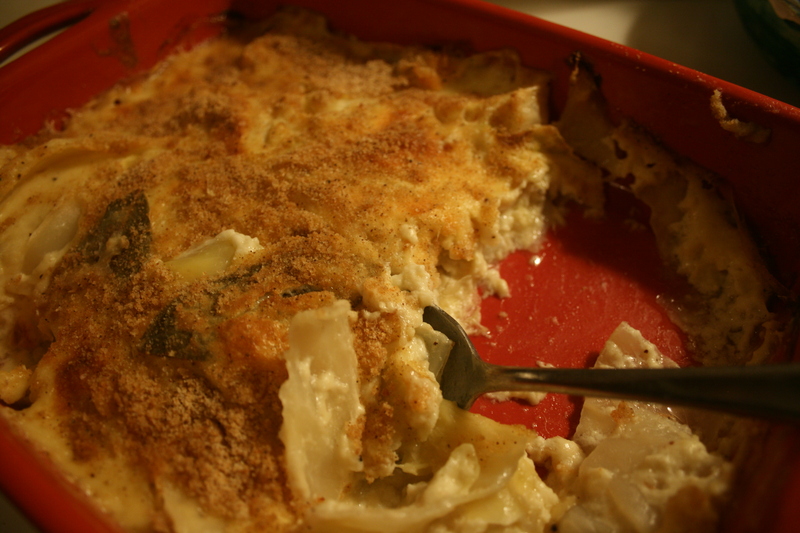 Grease a shallow ovenproof dish, lay the cabbage pieces in it, and pour over the sauce.. Top with the breadcrumbs. Bake about 45 minutes, until crust is golden and edges bubbly.